Have you ever wondered what's the story behind building mountain bike trails? It's something that you may take for granted but there's serious work and planning for each MTB singletrack out there. Of course you can build your own trail without going through all the trouble with permits from authorities, forestry people and so on. But by doing so you might do harm that you cannot see. The impact of any human action in a natural environment can be crucial to certain species of wildlife and flora and can also cause soil erosion, ravines, etc. 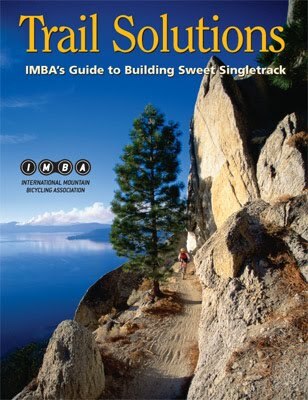 Below is a collection of videos made by International Mountain Bicycling Association (IMBA) and United States Forest Service (USFS) that teaches you how to build and maintain mountain biking trails - they also published this book. Use these clips as well as the bullet-ed transcripts as a reference in designing your dream MTB course. Mountain biking is one of the most popular activities around the world. It offers exercise, adventure, challenge, thrills and solitude. There different riding stiles: Cross country riders are looking for long rides to increase their endurance. Downhill riders are seeking speed and technical challenge. Free riders want the thrills and excitement of conquering obstacles. Singletrack riding is an exciting outdoor experience that provides a close connection with nature. It takes concentration, skill and physical aptitude but it's also esthetically pleasing. A singletrack 14 to 18 inches wide takes you through the geological features of the landscape being also easier to keep from eroding. The trails can also be used for hiking and horse riding. Build relationships and gain permission from land owner and/or manager. Show them that the trail will benefit them and other people as well - a good and popular trail can bring revenue in the area through tourism. 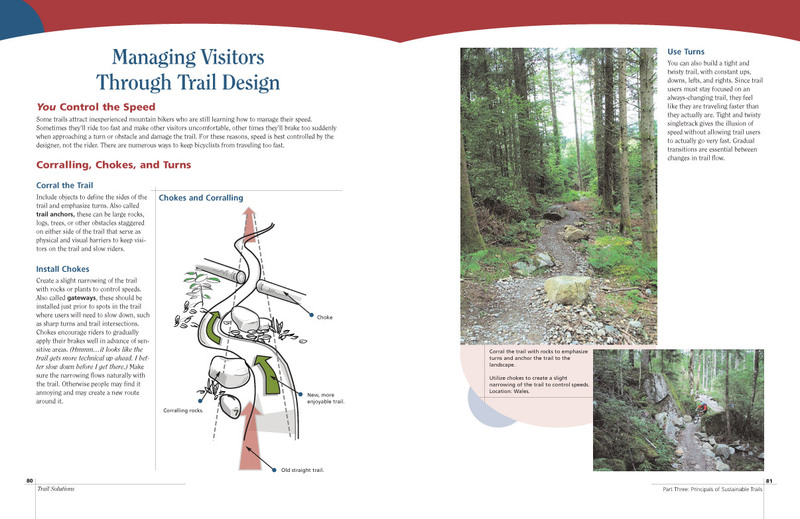 Bring a detailed proposal showing the goals and the benefits of the trail. Spend time in the field with the land agency and discuss the obstacles you want to have in the trail and other technical aspects. Be patient! It takes time for your trail design to be approved. Consider the environmental study that must be done prior to building the trail. This will help preserve wildlife, flora and particular landscape features. Building a legal trail must pass through this process but the convenience of this step being fulfilled is that the trail will get attention, maintenance and support from all parties involved (local authorities, individual cyclists, non profit organizations, etc). Building the trail on the prevailing slope (fall line) - water erodes the track and as bikers try to avoid the ruts, the track becomes wider and wider, spoiling the singletrack experience. Another design flaw is building the trail on flat terrain - rain water will form puddles and mud which will then be avoided by cyclists thus leading to widening the trail. Keep water off the trail and most other thinks will take care of themselves. Use a contour map and draw your trail, taking the biker to all points of interest like waterfalls, lakes, rocks, scenic overlooks, etc. Use loops as to add adventure to your trails. Each loop may have a part that overlaps with another trail of higher difficulty. Easy, wide and accessible trails should be closer to the trail head. The key for trail sustainability is to have water run across the trail, not down it. The 10% average guideline says that for each uphill and downhill section, the average grade of inclination should be of 10% or less. To calculate this, divide the elevation rise over the run (distance) - e.g. an uphill section of 475 feet elevation that measures one mile in distance (5280 feet): 475/5280=0.9 ~ 10%. Calculate this for each ascending and descending section of your track and keep it below 10%. The half rule says that the trail must have an inclination equal to half of the hill's slope. In order to find out the slope of a hill or mountain you need to use a clinometer. Don't use spray paint for marking the line of your trail - use flagging tape instead (it can be removed after the work on the trail is done). The maximum sustainable grade states that when a hill slope is too steep you may exceed the 10% average inclination but this is conditioned by the type of soil, amount of rock, annual rainfall and users (traffic). Example: trail grades can be steeper on solid rock but dry soil require gentle grades. Add ups and down to your trail - grade reversals. Their purpose is to help water exit off the trail. Look for natural depressions or obstacles that will force the trail to go up and down every 20 to 50 feet. These will also add thrill to the ride. To keep water running across your trail, you need to ensure the path has a 5% outslope tread. This means the outer edge of the trail tilts slightly down-slope. Avoid sharp zig-zags when designing a trail on a steep slope - the sharp turns disrupt the natural uphill riding flow and cause bikers to skid when cycling downhill. The skid marks cause erosion which you want to avoid at all costs. Instead, you can follow milder slopes and design larger turns (20 feet radius of the curve) having grade reversals both before and after the turn (water escapes). Outline the trail with pin flags either in the middle of the track or on the side - make sure to inform the working team about the way you marked it. Cover safety issues in the technical meetings. Pay close attention to the circle of death - a man working with his tool shouldn't reach a fellow worker - that is to say space each other out while working on the trail. Wear protective equipment like gloves, hard hats and sturdy boots. Bring food and water with you. For easy trails you may want to remove obstacles but for more challenging routes you should leave down logs and rocks as to add the extra push for the rider. Clean the corridor by trimming trees and bushes. Leave arching vegetation above the trail for a closer connection with nature. Natural landmarks like small tress left near the edge of the trail will keep bikers within a reasonable speed limit while keeping the trail from becoming wider. Dig the trail in a full bench - cutting the whole tread in the hillside. 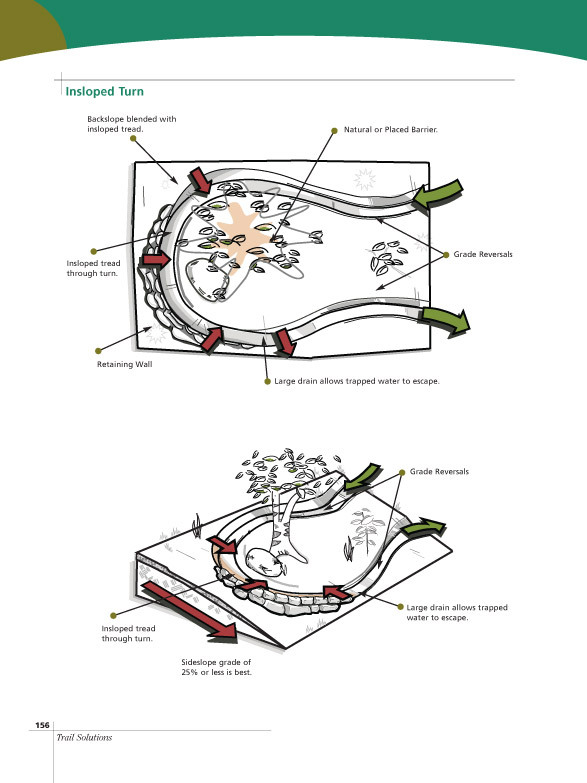 This design is recommended because it creates a stable tread and requires less maintenance. Shape the backslope for an even transition form the hillside to the tread. 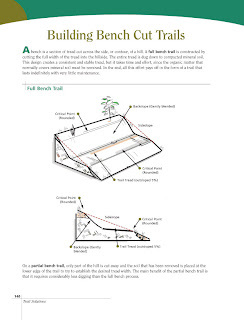 Use a McCloud tool for compacting the trail and the backslope. All the margins should be smooth. Outslope the tread - a McCloud tool will lean slightly downhill when placed on the trail - that's how you can measure the outslope. Disguise the construction efforts by covering dirt (resulted after digging the trail) with the branches, leaves and grass you got when cleaning the corridor. Make the trail look like it's been there for years. 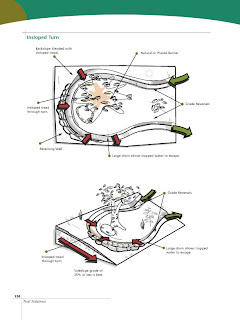 Armoring is a method used to harden section of trails where the soil is too soft or the slope is too steep. It consist of embedding flat rocks into the tread. Define the sides of the armored area with logs or rocks to keep rider on the trail. Water crossings can also be done using armoring, especially where the water is shallow. Bridges involve spending money and having engineers in the team - it's more convenient to design the trail to lead through parts of the stream where armoring will suffice. Technical trails don't require mountains. Work with what you have, no matter where you are. Use natural obstacles (rocks, logs, bumps), add exposure and you will design a thrilling trail. Create landing zones sloping downward 5% to 15% for drop-offs. Give warnings of the challenges ahead - provide good sight lines or add signs. Place high skill level qualifiers at the beginning of the trail as to let the biker know about the type of trail he/she is entering into. This will help the rider asses early on whether the trail is within his/her capabilities. A well designed trail with fun contour lines and challenging obstacles will keep riders coming again and again. Make your trail as popular as possible. A trail needs to be maintained on a regular basis. Reopen the corridor by trimming vegetation and removing fallen tress. 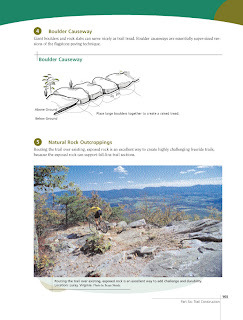 Restore the 5% outslope - remove the excess dirt on the outer edge of the trail. Remember to compact the entire surface. Improve water drainage bu building knicks where puddles form. Use foam balls to find out where the water will flow on your track (forming ruts) and where it will stagnate. If for some reason drainage problems persist you may consider re-routing your trail. Reclaiming portions of damaged trails is as important as designing sustainable singletrack. Loosen the dirt at least two inches deep after which add logs, rock, grass (turf), plant trees or shrubs. This will scare off bikers, pushing them to ride the re- route. You can buy the book (Trail Solutions) and learn more about building sweet singletrack here. Sweet instructionals. My kids are dying to have some paths built. I knew I could count on you guys! Pretty nice post. I just stumbled upon your blog and wished to say that Ive truly enjoyed surfing around your blog posts. Clean the corridor by trimming trees and bushes. 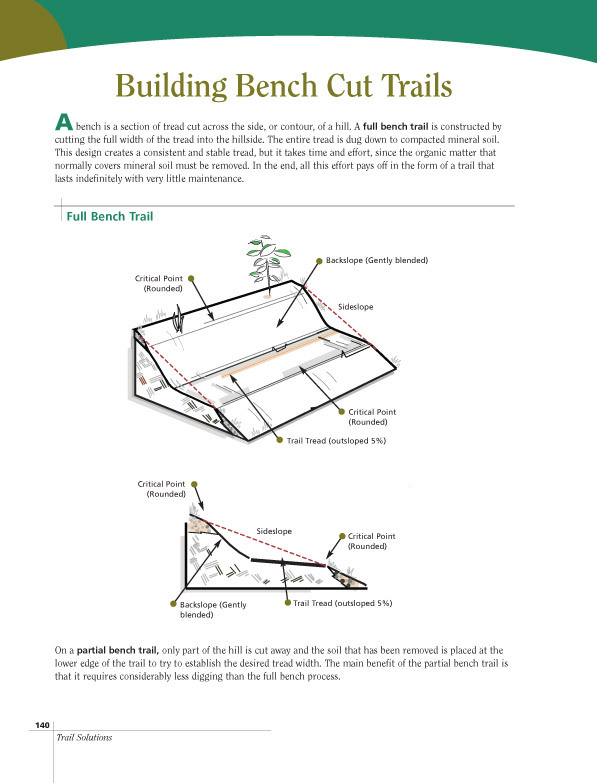 Leave arching vegetation above the trail for a closer connection with nature. Natural landmarks like small tress left near the edge of the trail will keep bikers within a reasonable speed limit while keeping the trail from becoming wider. In any case be subscribing to your feed and I hope you write again soon! Thanks for sharing. Thanks for your thoughts Henry!